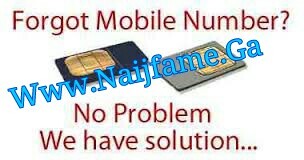 Sometimes you may find it difficult to remember all you mobile phone numbers especially now that one has to have multiple mobile phone Sim-cards that enables us benefit from all the Mobile Network (MTN ETISALAT GLO AIRTEL). To check and know your own mobile phone number on Air tel Nigeria, simply dial *121# and follow the onscreen instruction. Select 1, and send for My Account option. Then the next screen, select 1 and send as My Number option, and snap! Your screen displays your own mobile number. There are many ways out here. One, dial *123# and follow onscreen guide. Respond with option 1 and send to select My tools option. Then select option 5 in My Tools to demand for My Number. And snap! Your own mobile number is displayed on your screen. And the message received at the other end will display your number. Simply dial *135*8# and you see your number displayed on your screen. Hope this guide has helped you in finding out your forgotten mobile phone numbers and if in case you are not satisfied kindly feel free to use our reply option below to comment and tell us the problem you are still having. Please Share this to your friends and rate us!! !